We stumbled across this place in the hopes of finding an affordable and tasty lunch. A lot of the restaurants down by the water are quite pricey so we were stoked to find this Vietnamese restaurant. It was filled with people, so we knew it would be worth trying. And the food! My lemongrass vermicelli noodles were fresh and flavoursome, with herbs and heat. Mum had lemongrass chicken stir fry on rice and said the meal was to die for. My drip coffee was authentic over condensed milk. I’ll be back for sure. Fisherman’s Plate looks like your regular run-of-the-mill takeaway. They have a long standing tradition of serving fish and chips, and they have an extensive Vietnamese menu. I was going to just go with my usual pho, but decided to take the path less trodden. 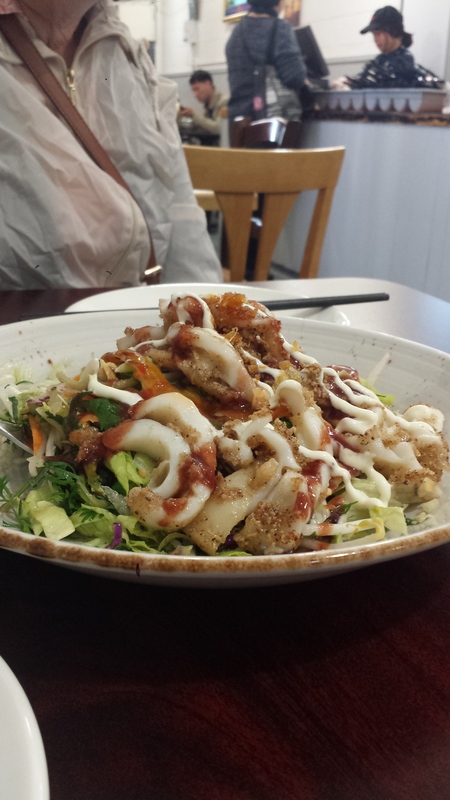 We had salt and pepper squid with green tea soba noodles and Vietnamese salad. It was to die for, absolutely stunning. The soba salad was warm, plum sauce sweet, tender, lightly seasoned squid, fish sauce salty, had a peanut nuttiness, had some red cabbage colour, and fresh herbs for punch. This dish is a true revelation. We ordered two and I would be happy to eat it all day. This restaurant is a hidden gem. It may seem tame from the outside, but do yourself a favour and jump right in. It will be the best Vietnamese you’ll have in Wellington. I’ve walked past this place for years and never given it two thoughts, because to be honest, it doesn’t look like much from the street. Serving traditional Vietnamese Pho along side the classic cransky, chips and salad. They do Western and Eastern in a place that seems like an Asian diner. But they always have a full house. Students, tradies, couples, everyone. 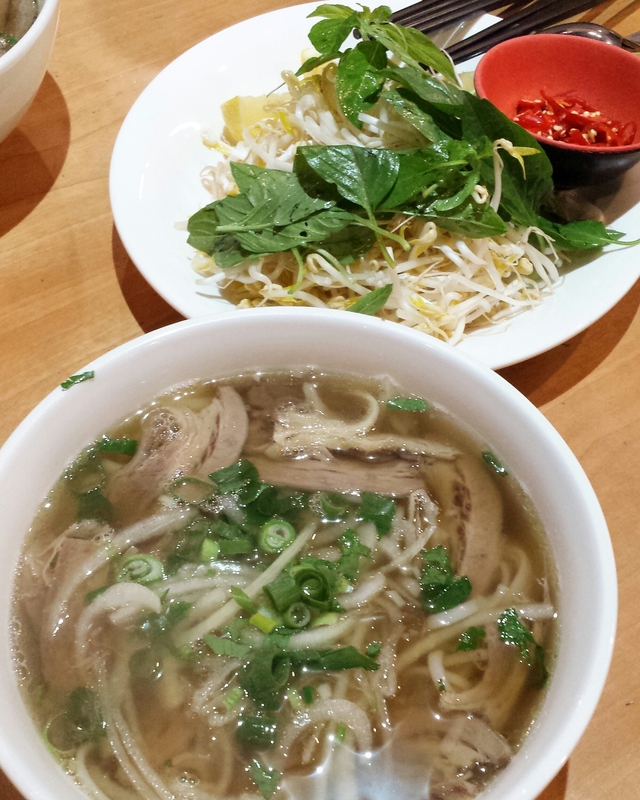 I went tonight and had an excellent bowl of truly memorable pho. Fresh bean sprouts, lemon and Thai basil to accompany a big bowl of steaming pho. It was full of flavour and depth with a generous serving of meat and noodles. Cheap price too. Very satisfied!